Our mid category room, Aviator Studios centrally occupy space on the second, third and fourth floors. 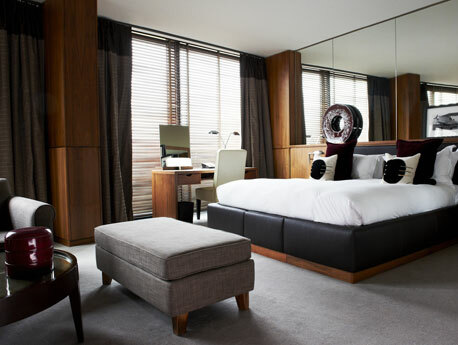 With a spacious open plan bed and seating area with oversized armchairs, Studios set a scene for style and tranquility. Aviator Studios are 35 square metres in size with super king size beds, open plan seating area and large wardrobes. Additional facilities include speciality teas, cafetière and a wall mounted LCD screen. Designed for the opportunity to indulge in a romantic weekend break or recline in comfort, Aviator Studios come with the option of a spacious bathroom with separate walk in shower and bath tub, or an airside view with floor to ceiling sliding windows. An intimate Tasting Menu dining experience, combined with a luxurious night to remember. From £275. Stylish lounge areas and tables for dining. Chosen for their quality and passion with which they are produced.